Residents are encouraged to bring along a reusable bag when shopping, instead of using bags that are made available by retailers. At checkout, paper bags will cost 10¢ each. Retailers in Truckee are prohibited from using single-use plastic checkout bags at their store locations. With Truckee’s Single Use Bag Ordinance, the city has joined over 100 other California communities who are protecting local streams, rivers and lakes from plastic bag litter. Learn more about the ‘Bring It Truckee’ campaign. Paper bags can be recycled, even if they have handles attached with adhesive; adhesive does not contaminate paper recycling. If the handle is not made of paper, tear it off and then recycle the bag. Wet or soiled bags should be thrown away because food residue and grease contaminates recycling. If it’s possible to remove the soiled portion, do so and then recycle the parts that are clean. Sometimes gift bags can be recycled, but if they have a glossy coating, they are most likely made from plastic and paper and so cannot be recycled. More about reusing, reducing and recycling gift bags. Skip the paper bags altogether and bring your own reusable bags, which reduces how much you need to throw away or recycle. 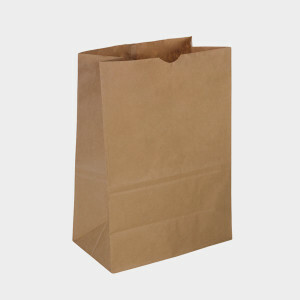 If your paper bag is still in good condition, try reusing them as many times as you can. Instead of throwing your trash into a plastic bag, use a paper bag because they will actually break down in the landfill. Paper bags can be cut up and used as wrapping paper for small gifts. Larger shopping bags can also be used as book covers. Plastic bags have their problems but so do paper bags. Although paper bags do degrade much faster than plastic bags, it takes nearly double the resources to create a paper bag than one made out of plastic. That’s why reusable products are better than paper or plastic bags.